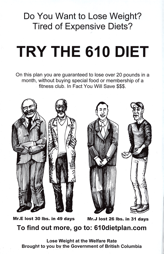 In the summer of 2012, Raise the Rates launched the 610 Diet with a poster and video. The purpose of this campaign was to point out, in a humorous way, that BC’s welfare rates are bad for people’s health, as those on welfare cannot afford a healthy diet. Raise the Rates is eternally grateful to the team from Capilano University for making the video.